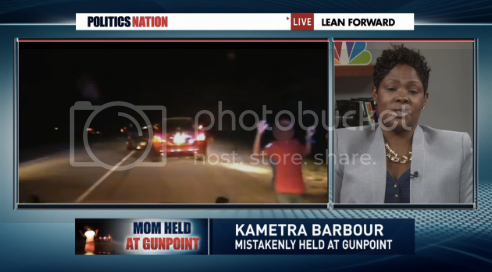 Kametra Barbour was pulled over at gunpoint by police in Forney, Texas, while her two children and two god children were inside. The traffic stop was in response to a 911 caller who had told dispatch four black men were waving a gun out the window of a beige- or tan-colored Toyota. Barbour drives a burgundy red Nissan Maxima. Barbour says she was afraid but maintained her composure during the traumatic stop because she saw her children were afraid. She told Rev. Al Sharpton on Politics Nation, "I have to follow the instructions of these officers because I cannot have the thought of my children seeing me being gunned down in front of them. That was the thought in my head at this time."